Researched, compiled, written and copyright 2000-19 by David Cohen. Last updated: 2019.1.30. Main web site & contact (corrections and omissions): Canadian Chess. Les Échecs en dix leçons: 1er fascicule - Les Notions Élémentaires by Lorenzo Prince, sb, 192? Play winning chess: opening moves and counterattacks by Brian Drew, 1976 is a pirated copy of Chess in an Hour by Frank Marshall, 1937 as revised by Irving Chernev, 1968 and 1975. Anglo-Benoni Two Knights Defense by Paul Janicki, 198? Anglo-Benoni Four Knights Defense by Paul Janicki, 198? Flohr-Mikenas System, English by Paul Janicki and Jerzy Konikowski, 198? Canadian Checkerist, 1888 - ? 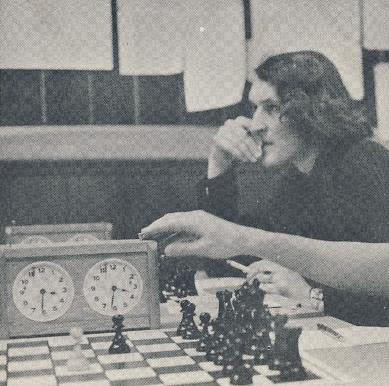 City Chess Club Newsletter, (Toronto), 19?-19? Governors' Letter, Chess Federation of Canada, sp (later PDF), 197?- 2010-11 No. 1 - ? Northern, Chess Federation of Canada, sp, No. 1 1983.05 - No. 65 1994.08 - ? Saskatchewan Chess, sp, Vol. 20 1962.03 - ? - 1963.03 - ? - 1964.01 - ? - 1964.07 - ? Chess is Awesome, 2011 - Chess Institute of Canada. Executive Producer and Script: Ted Winick; Consultant: David Cohen; Director of Photography: Carlos Esteves. Starring Ted Winick, President, Chess Institute of Canada; and friends Theadora, Joseph and Mary. W-5, CTV, 2004.5.29 - program with a segment exploring whether or not chess can increase a student's math abilities by improving their problem-solving skills. Note: Information is not always obtained from the originals, so the starting and ending dates are not necessarily accurate, especially for a particular editor/writer. If you have additional information, please let me know. Gazette, Montreal, Quebec, by John Henderson 1886.01.29-1896.04; Dr. Cunliffe 1896.04-? Monitor, Montreal, Quebec, by Moe Moss, 1962.08.09; Bryan Knight, 197? Montreal-Matin, Montreal, Quebec, by Marie Williams, 197? La Presse, Montreal, Quebec, by ?, 1890-1895.04; M. Pelletier, ?-1895.04, 1895.04-? ; O. Trempe, 1897.08-1924.01; St. Maurice Sr.; Charles-Ephrem Saint-Maurice, ?-1938; Charles Robillard, ?-1956, 1956-? ; Bernard Ouimet, ?-1971.12, 1971.12-? ; Camille Coudari, ?-1977; Denis Coté, 1977-? ; Jean Hébert 1981-87; Yves Boisvert, ?-?, Yves Leclerc, ?-? ; Sylvain Barbeau, ?-? Northern Sentinel Press, ?, by Mike Bateman, 197? Ottawa Journal, Ottawa, Ontario, by Jonathan Berry, ?-1977, 1977-? Peterborough Examiner, Peterborough, Ontario, ?, 19? Prince Albert Herald, Prince Albert, Saskatchewan, by Joe Lozinski, ?-1977, 1977-? Red Deer Advocate, Red Deer, Alberta, by Wes Denison, ?-1977, 1977-? Saskatchewan Farmer, Regina, Saskatchewan, by Frank Yerhoff, 1953-? Saskatoon Star-Phoenix, Saskatoon, Saskatchewan, by Harry Mather, ?-1977, 1977-? Nouvelliste, Shawinigan, Quebec, by Roger Greiss, ?-1977, 1977-? Smithers Interior News, Smithers, British Columbia, by Van Sarac, ?-1977, 1977-? Thunder Bay Chronicle-Journal, Ed Rohanchuk, ?-1972-? Globe, Toronto, Ontario, by John Gordon, 1870.02.19-? ; Prof. Chewett, ?-? ; John Cherriman, ?-1875.09; ?, 1875-1876; George H. Larminie, 1876; ?, 1876-1883.02.03; ?, 1907.10-1915; Malcolm Sim, ?-? Saturday Night, Toronto, Ontario, by 'Centaur', ?-1953,1953-1956,1956-? ; Dudley LeDain, ?-1966.04, 1966.04-? Victoria Colonist, Victoria, British Columbia, by Ray Kerr, ?-1977, 1977-? Weston Times & Guide, Weston, Ontario, by Henry Loose, ?-1953, 1953-1956, 1956-? Manitoba Weekly Free Press, Winnipeg, Manitoba, by ?, 1889.05; H. Gregory, ?-1935, 1935-? Tribune, Winnipeg, Manitoba, by ?, 1915-? ; J.H. Booker, ?-1934, 1934-?